Well it sure looks like It is a good start. Tried some holly the other day, nice, subtle grain. Looks fantastic in my opinion. The bottom one in the first pic is an eye catcher for me. Nice work. Those all look great! As much as I like the top pics, that Holly really has a cool look to it. Great job, love cherry for spoon an such. That holly has a good looking grain. That holly is interesting.......l ooks a lot like some olive wood handles I've seen. NICE WORK! It looks like you are off to a good start! But holly berries are toxic and I would caution against using it for eating utensils. I knew the berries were toxic, but didn't realize that toxicity extended to the wood. And thanks to all for the kind comments! After a google search, there seems to be a good bit of info concerning holly and it's properties. 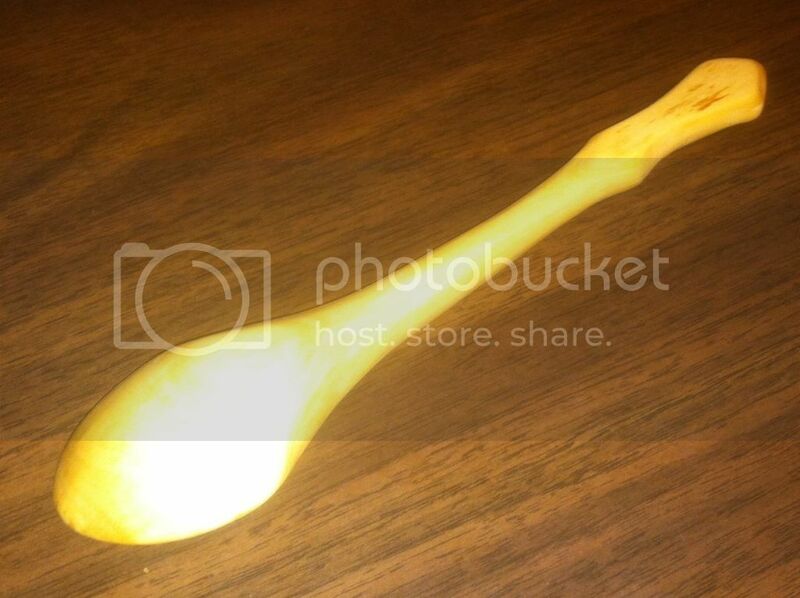 Toxicity of the wood is not apparent, and quite a few "expert" spoon carvers highly recommend it. Rhododendron is toxic as well, if you eat the leaves but I've heard is fine for spoons. Walnut trees can kill competing plants that try to grow near one, but it have used a walnut spoon for ages. I haven't looked into Holly, but still wouldn't worry too much. Toxicity is one of those words that sounds scary, but might be virtually meaningless in some instances. Maybe not the best example- Some people are allergic to poison ivy, some are not affected by it, PI is listed as a toxic plant. You have to know how the thing affects you. On the other hand toxicity can also mean very deadly. I would hate to give someone something that could be potentially harmful. I know poke salad berries are toxic (my brother had to have his stomach pumped when we were kids) but my grandmother used to cook and eat the leaves all the time. Nothing wrong with caution. I'd hate to be wrong on this. My confidence is quite high most woods you'd want to use for wooden ware are safe unless eaten. Of course ring, and semi- ring porous have higher potential to harbor bacteria. After some research, (and having found nothing concerning toxicity) I decided to try some Chinese Privet (aka waxwood). This was stained with tea. Darned nice work, Mr.FixIt. I think you are on a roll here. A side note about hollies (won't consume this thread) but there are a few whose leaves make a phenomenal tea! Yaupon holly tea is incredible and the most caffeinated plant in North America. Yaupon holly tea is incredible and the most caffeinated plant in North America. I need me some of THAT!! Nice work, and Thanks for posting. Thought I'd give it a try. 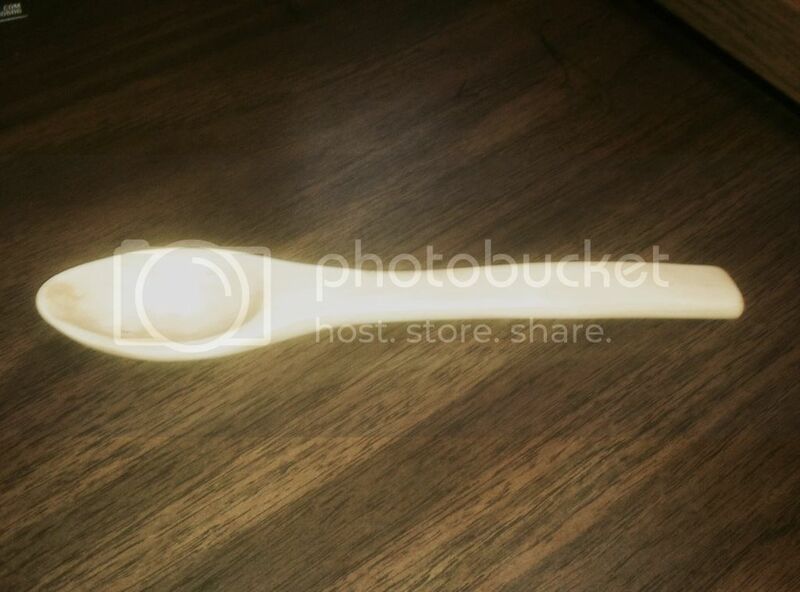 It looks like your photobucket for some reason doesn't give image links? A couple more carved from privet. Really nice shape on these! Many 'spoons' don't look like one.......those three scream SPOOOON! 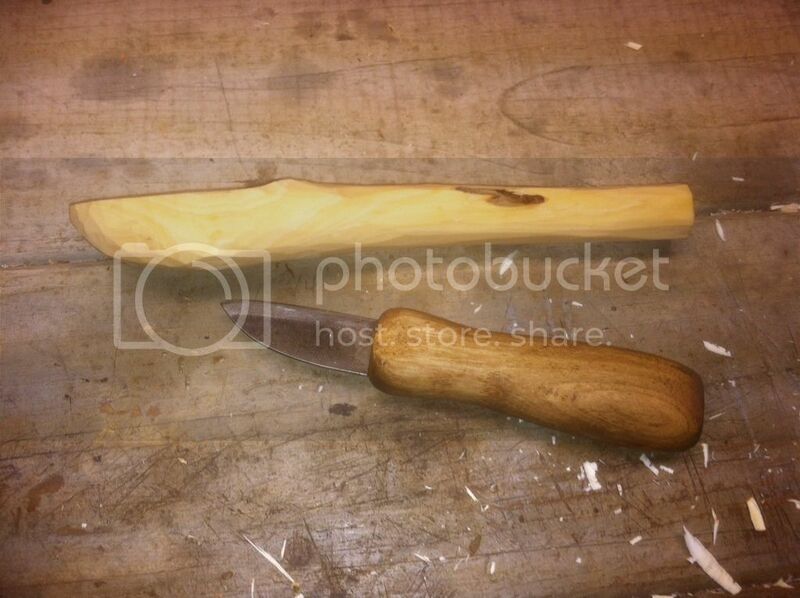 Another small eating spoon carved from privet. This one was oiled only, no stain. Has a slight downward curve to the handle. Finished these the other day, one is going to NY and the other to VA. Both are carved from privet, and finished with several coats of mineral oil. here's those photos. not sure why you couldn't post them - or the last one anyway. the first two were missing the front bracket. "[" <~~~~~~~~ that thing in quotes. Which ones have you used? Or maybe you give each one a test bowl of Cheerios? 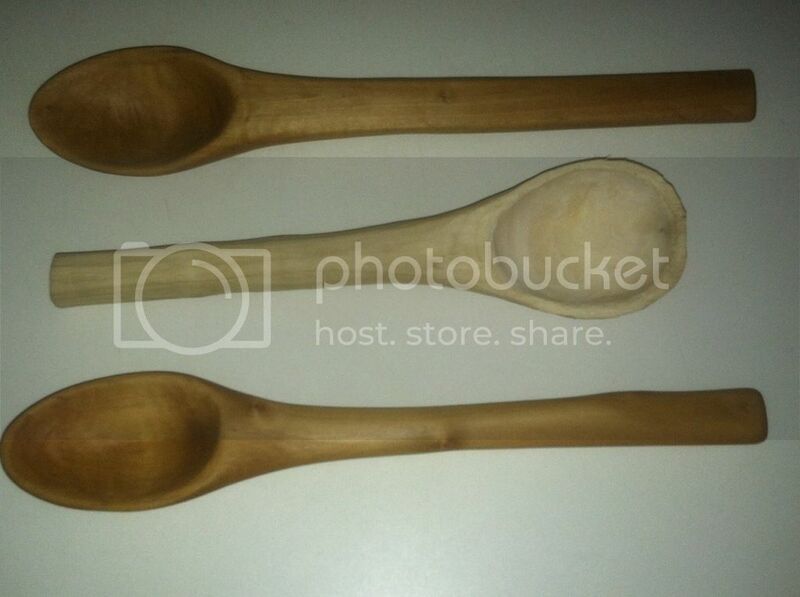 I guess what I'm asking do regularly eat with a wood spoon, now that you're carving them? 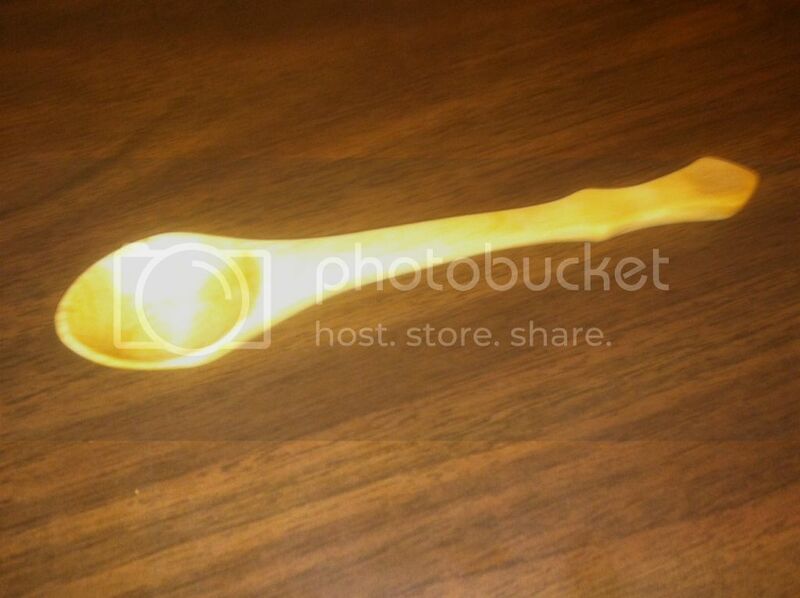 @ Unknown, I have used a couple of them, make some good chili spoons. I just wash them, allow to dry, then re-coat with mineral oil. Nice work! Nice accent at the end of the handle. I would like to think that my carving skills are getting a little better. I at least feel more comfortable with it. I think you are getting better. I have trouble getting a good picture too. Spoons are hard to capture. My cell phone photography leaves MUCH to be desired. This was carved from wild Bradford pear. Each one is better than the previous. Very nice! I have some Bradford pear in the firewood pile. It has some beautiful grain and curl. Is it as tough to carve as it is to split? It carves pretty good, reminded me of privet with the grain changes and small hidden knots. This was an experiment using this wood. It is considered an invasive species. The next one I do I will give it a tea stain to see what happens. MFI, as I scrolled down this thread, I am impressed with the progress you have made. My compliments, sir! Did you use sapwood or heartwood? Thank you QC! I initially was having problems with the bowl shape of the spoon, but once I learned how to properly use my hook knife, it started getting a little better.